This special very limited edition photo (i.e. 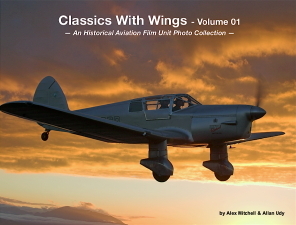 coffee table) book contains 65 full size A4 photographs from the Historical Aviation Film Unit's archives. Printed on high quality, glossy, heavy weight paper, and hard bound, this is a great collection of some of the best photographs from our collection. 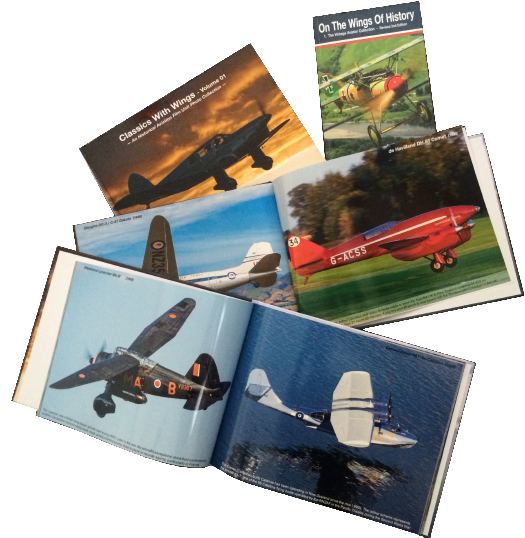 The book features aircraft from the earliest flimsy contraptions such as the Bleriot XI and Avro Triplane, through to the World War One warbirds of the Vintage Aviator Collection, a diverse range of inter-war aircraft including de Havilland biplanes and types used by the RAF such as the Hawker Hind and Gloster Gladiator. Many Second World War aircraft such as the Spitfire, Mustang, Corsair, Polikarpov, Lavochin and Avro Lancaster are featured, as are a number of post-war jets including the Strikemaster, Canberra, Vulcan and de Havilland Venom. This is not a reference volume, but if you want a book to sit on a table or desk somewhere, with some glorious photographs of some amazing machinery that you can periodically open up and enjoy, then this is a great option. Below you'll find some example page spreads from the book, which will give you an idea of the size and format of the book. Each page features a couple of lines of description about each of the aircraft types at the bottom of the page -- you should be able to see this in the sample spreads below. Including GST (tax) and postage within New Zealand. Additional Postage charges will apply for orders outside New Zealand. The extra charges below will be added to your order when your card is charged. A copy of our standard A5 book, On The Wings Of History is shown at top right to give an indication of the comparative size of Classics With Wings. You do not receive a copy of On The Wings Of History when you purchase Classics With Wings.